I recently came across an old "Notice of Mining Location " paper that was filed back in Arizona's Territorial days. As I researched the location of the claim, the people involved, and the date that it was located, I began to think that the document may be more than just another old mine paper. This old document may be related to the well-known story of how the mine camp of Christmas Arizona got its name. There is a bit of information, in the claim notice, however, that may conflict with the details of how that story is usually told. In the 1880's valuable minerals were discovered in an area north of Winkelman Arizona in the Dripping Springs Mountains. Government officials soon realized that the claims were located within the boundaries of the San Carlos Indian Reservation. A cease and desist order for all mining activity in the area was issued. On December 22nd, 1902, President Theodore Roosevelt, in a one sentence executive order, decreed that the western boundary of the reservation would be re-drawn to the east so that the contested mineral lands would then fall outside the reservation boundary and thus be re-located in the public domain. 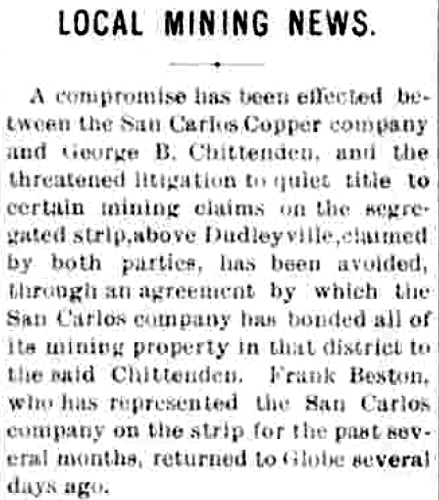 I believe that the paper that I have is one of the original Notice of Mining Location papers that were filled out by the Chittenden and Mellor group as they staked their claims in December of 1902. The location of the claim is stated as: "situated and located in the San Carlos or Banner Mining District". When the Christmas area was within the boundaries of the reservation, it would have been assigned to the San Carlos district. Its new assignment outside the reservation would have been the Banner District. Continuing: "in Gila County, in the Territory of Arizona, about 1 1/4 miles in a westerly direction from the Gila River and about 1500 westerly from the old San Carlos Smelter"
The ruins of the ghost town of Christmas are essentially centered on the 1 1/4 mile westerly distance from the river. The old San Carlos Smelter had been built by the first miners to work that area. The top signature on the claim notice is N.H. Mellor, who along with G. Chittenden were the two prominent actors in the Christmas story. I have not been able to locate any information on who McCallister and Eldredge were. The date that the claim was located is very interesting. 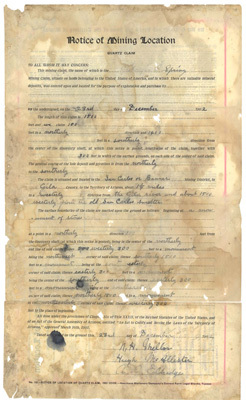 It occurs in two places on the paper: "was entered upon and located for the purpose of exploration and purchase by the undersigned on the 23rd day of December 1902" and "dated and posted on the ground this 23rd day of December 1902". This date in the claim notice does not agree with the dates as told in the story by Mellor and Chittenden that they made their first discovery on December 25, 1902. So what is up with that? 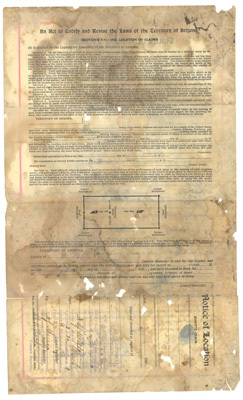 The Notice Paper is a valid claim location document. It is embossed in two places with the seal of the County Recorder of Gila County. The reverse side has the date and time that the paperwork was turned in at Globe, the county seat. It was received at 8:30am on March 7th, 1903. The recorder signed the document and recorded the number of the book that the claim was entered into. With which of the 35 to 40 claims that the Chittenden group staked is this location notice associated? It is difficult to read the name on the paper. Very faintly, the word "Geological" can be seen. More prominently to the side is the word "Spring". 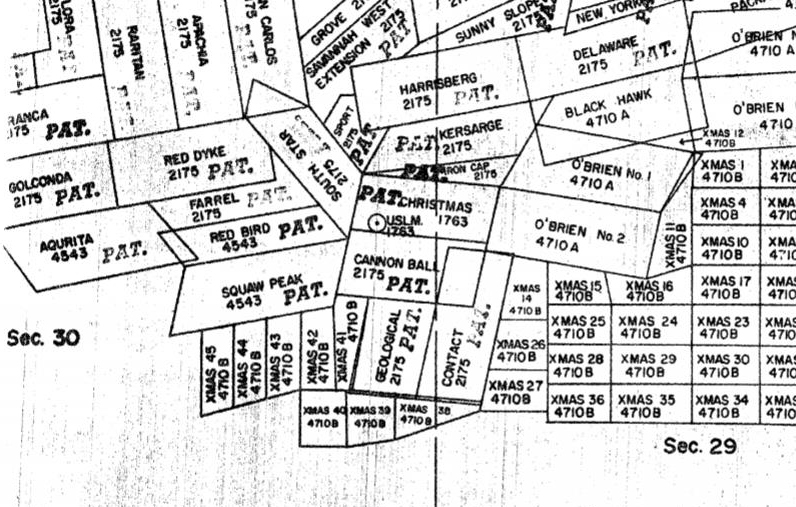 From this map of the early Christmas area claims, there is one that is named "Geological". There are no claims that have the word "Spring" associated with their name. Perhaps research at the County Recorders Office would reveal the name of the claim that was used. So What Gives On The Dates? The sequence of events according to the Mellor/Chittenden Christmas name story were that Roosevelt signed the executive order on the 22nd; Chittenden received notice of the signing on the 24th; and the first claim work was done on Christmas Day, the 25th. The dates in the table that show when the claims were located do not jibe with the schedule presented in the Christmas name story. Apparently, Mr. Chittenden was one of the driving forces behind the change in the reservation boundary. His influence was noted in this newspaper article that was published in the Arizona Silver Belt on October 13, 1904. Is There Any Evidence That There May Have Been Early Entry? 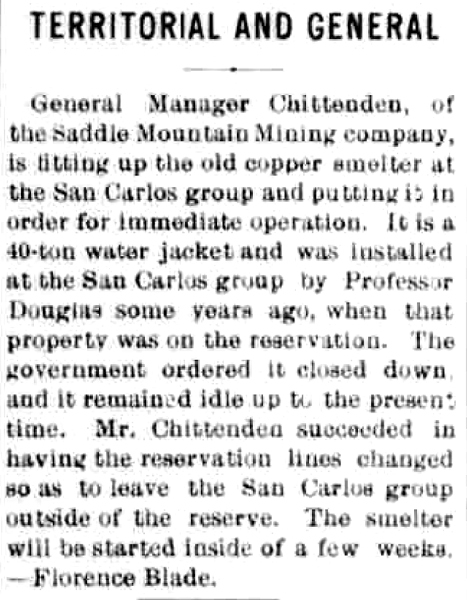 This article from the September 3, 1903 issue of the Arizona Silver Belt acknowledges that settlement. Are there other versions of the Name Story? Marjorie Chittenden was one of George Chittenden's daughters. The 1930 Connecticut census shows her living with Mr. Chittenden in Madison. The article is a listing of her memories from her childhood of the times that she visited and lived in Christmas, Arizona. There is this entry in Marjorie Chittenden's memoir: NOTE: George Chittenden named the mine and the camp "Christmas" because he had been born on Christmas 1849 and also married on that day in 1876. He died 02/24/39". 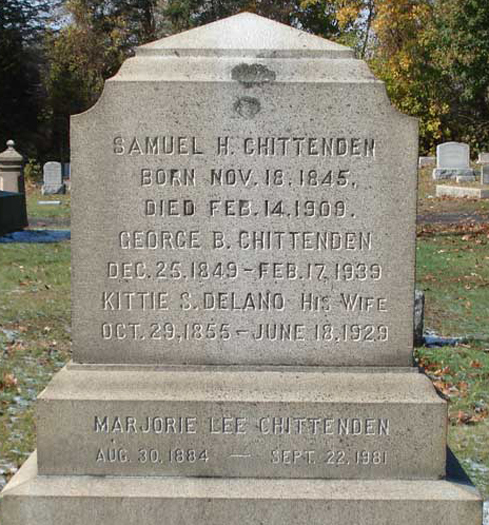 This photo of the Chittenden family marker confirms Mr. Chittenden's Christmas day birthdate. How Did I Come To Have The Claim Location Notice? It was strictly accidental and my good fortune! My mother was going to donate several books that she had to one of the local thrift stores. She had asked beforehand if I wanted them. The Mining Location paper fell out as I was thumbing through the pages of one of the books. She had no idea what the paper was about or where it had come from. She had obtained the books from a friend when we were living in Winkelman, Arizona. Years ago, her friend, a Mrs. Finch, and she were taking art lessons together. Mrs. Finch was using the books for inspiration for her artwork. She had given the books to my mom. Unfortunately, Mrs. Finch had passed away, so there was no way to ask about where the mine location paper had come from. 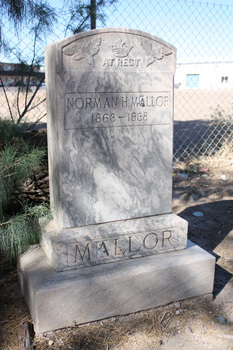 Mr. Mellor remained in the Winkelman area until his death and is buried in the Winkelman cemetery. My dad remembers him from the 1930's as an eccentric old man who lived in a little shack out in a mesquite thicket. My dad says that you would never have guessed that he once was a prominent mining man. The camp that the Chittenden group worked out of was located on Ash Creek, northeast of Winkelman. The photo on the left is how the camp looked in 1903. The photo on the right is the camp location as it appears today.